Want To Get Out Of Survival Mode? After reading Stephen Covey’s 7 Habits of Highly Effective People several years ago (I highly recommend it) I really attempt to consider his four quadrants for time management as I attempt to organize my life. Covey proposes that all activities fall into one of four categories – Urgent and Important, Not Urgent but Important, Urgent but Not Important, or Not Urgent and Not Important – and that how much time we spend in each quadrant impacts our effectiveness. Of course we tend to focus on things that are urgent (because they’re urgent)– and often those things, the ‘fires’ really ARE important. But they also keep us running around frenzied and disorganized. Covey recommends taking the time to focus on important things before they become urgent and completing activities that help you do things in a way that’s faster and easier. That covers the first two quadrants. It’s probably quite normal and understandable that many people have a tendency to spend more time than they should in the last two quadrants, but it’s not effective. The third quadrant (Urgent but Not Important) can feel so important sometimes – things like long phone calls, answering emails, and doing things for other people – it’s difficult to pass those things up and if you do you risk feeling guilty. Then there’s the fourth quadrant, things that are almost unquestionably time wasters. They’re usually anything that you do without conscious thought – eating, watching TV, surfing the internet. 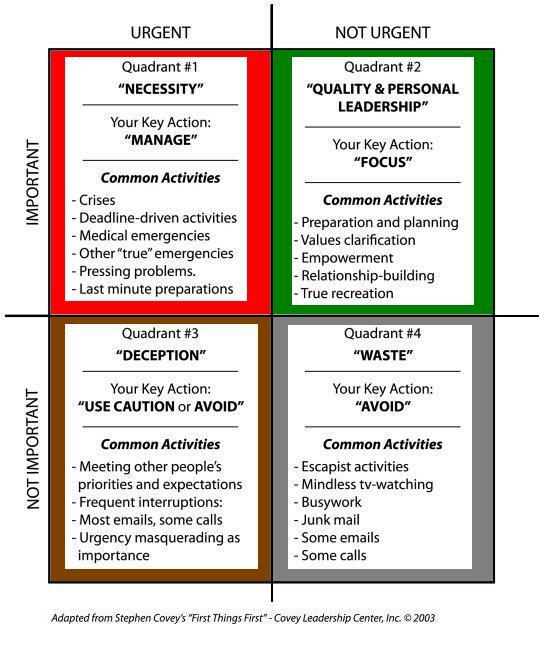 In my experience I spend more time in the fourth quadrant when I spend less time in the second. I have significantly less energy when I don’t take care of my health and spirit properly and end up wasting time with things that drain me at a soul level. 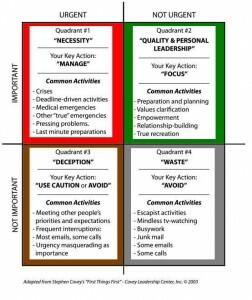 It may even be possible that the ‘fires’ in Quadrant One are simply an indication that you are spending too much time in Quadrants Three and Four and that the best way to prevent them is by spending a lot more time in Quadrant number Two. PS: I keep a copy of the quadrants in my office to help me remember where I should spend my time. If you read yesterday’s post you know that gratitude can make you happier and healthier. But what if you aren’t naturally a very grateful person? Well you’re in luck because studies show that you can deliberately cultivate gratitude – increasing your well-being and happiness in the process. It just requires a little mindfulness on your part but I promise it will be worth it. Decide to be grateful – The first step to changing is make up your mind. Start looking for new situations and circumstances in which to feel grateful, bring gratitude into your experiences, instead of waiting for something to feel grateful for. Control your thoughts especially your self talk – Grateful people use language that evokes images of gifts, blessings, fortune, and abundance instead of deservingness, regrets, scarcity, and loss. One simple technique is to stop saying that that you have to do something and start using words like get to or will (trust me, this works). Consider reframing difficult circumstances (like changing your focus from how cold the weather is to the beauty of the snow on the ground). And if you’re facing something that doesn’t seem to have a silver lining try putting it in perspective – ask yourself ‘What good might come from this?’, ‘What will I be grateful for in the future?’, or ‘What can I learn here?’. The key to leading a thankful life is embracing setbacks as part of your overall journey without letting them take over your life. Learn to live in the moment and look for things to be grateful for – Gratitude is a way of viewing the circumstances of your life, so don’t focus on what you don’t have – look for the good in what you DO have. Learn to find joy in the small things instead of holding out for the biggies like a promotion, getting married, or having a certain amount of money. Watch the sunrise over the lake, or savor how wonderful those fuzzy socks feel at the end of the day – whatever it takes to slow down and immerse yourself in the beauty that is all around you. If that’s a little challenging try watching this amazing TEDxSF video ‘A Good Day’ – I think I might just start watching this every morning! Steep yourself in inspirational thoughts and motivational quotes. – It’s difficult to be unappreciative when are surrounded by reminders of your blessings. You could sign up for daily motivational emails, get familiar with a holy text, or create and display a Gratitude Board filled with the people and experiences that you are most grateful for. Put it in your schedule – Pick a TIME to focus on your blessings every day, it could be while you brush your teeth, during your commute, when you do a Minute Movement or (my favorite) while you fold laundry. Or you could use the old standby and keep a gratitude journal. I have a friend who keeps a family gratitude journal on the dining room table making gratitude an integral part of the evening meal. Whatever you do, setting aside time on a daily basis to remember how fortunate you are helps you retrain your brain to notice the positive. Invest in the people you love – Practice telling the people in your life something you appreciate about them every day, write a letter to someone who has had a positive influence on your life, have coffee with a friend and relish the feeling of belonging. Tomorrow is the perfect day to start developing the habit of gratitude. Enjoy time with your people, count your blessings, say a prayer for someone who’s struggling. What is one small thing that you can do this week that could make a profound impact – either on your life, someone you love, or something you believe in? You probably know by now that I believe that micro decisions create Macro Results and as I think about that today, I think I want to focus on something this week that will make a difference in the life of those around me. This week I will focus on listening better – as I go through my day, talking with people; I want to listen to them on a deeper level and really connect with them better than I ever have before. So what is one small thing that you can do this week? What’s that one thing you’ve been putting off that would really make a difference? Maybe it’s getting up five minutes earlier and making coffee for your spouse, maybe it’s writing a letter to a loved one that you haven’t talked to in awhile. I encourage you to ask yourself, ‘What is that one thing?’ – and then do it . Post your one thing on our Facebook page so the Minute Mover community can stand with you . Every day you are faced with decisions that seem mostly insignificant to the outcome of your life. Do I floss? Should I have a salad or a hamburger for lunch? Supersize or regular size? Soda or water to drink with my meal? Speak a kind word or not? Read something or watch TV? Read a Facebook post or get my work done? You get the picture. There are obvious good choices, and on the contrary, there are obvious poor choices. Most of us don’t even think beyond the choice. There has been an eastern movement which focuses on awareness of living in the present, which certainly has its place (which I will address in a different post), however not to the determent of who we say we are and who we envision ourselves to be. You might say, Aaron, come on, putting sugar in my coffee isn’t a reflection on who I am and who I claim to be. And I would challenge that statement. If you claim to be a powerful, healthy, strong, ______ (you fill in the blank) person choosing to add something to your coffee isn’t “bad or wrong” – but is out of integrity with who you choose to be? We have to look at what we call the “micro-decisions” of the addition of sugar, not just the here and now of the choice. If we add 15 years of sugar to our daily coffee, the “macro-result” is certainly a whole lot of wasted calories and could lead to extra pounds, addiction, skin issues, hormonal issues, diabetes – even mental issues. Whereas sugar in moderation isn’t necessarily going to send you to a convalescent home. My point here is that the little choices in life are what make up who you are in the long run. The small choices add up. Is one cigarette going to kill you? Not likely. However if you continue to make the micro-decision to smoke, what are your odds of death? I know that smoking might seem like an obvious threat to your health but what are the less obvious micro-decisions in your life that go against who you say you are? What are the micro- decisions that you make that go with who you say you are? You are still a vital living being and the beauty of your life is that you can change it on a dime, and begin to make good micro-decisions that lead you toward optimum macro-results – the big things you want out of life. 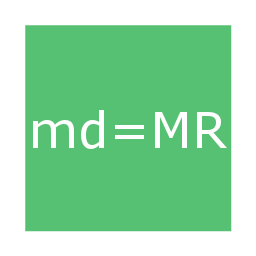 As I’m faced with decisions every day, I constantly stop and think what is the macro-result of this micro-decision? If we never cross paths again I want to make sure that I leave you with a litmus test to challenge your micro decisions against your ideal you. And remember, your micro-decisions create your Macro-Results. I’m so happy that you’ve decided to see how one minute can change your life with the Minute Movement program! Minute Movement was designed to be very simple so that you can spend your time getting fit instead of planning and researching. Step one: Set alarms or timers to remind you to complete your exercises. We recommend setting your timer for every hour after you arrive at work (Monday through Friday). So for people who work a typical eight to five job, you’ll set your timer for 9, 10, 11, noon, 1, 2, 3, 4, and 5 – once you do your five o’clock movement, you’ll pack up and go home. If you have a different schedule just make the necessary adjustments. One of our awesome Minute Movers mentioned to me that she always has something going on at the top of the hour, so she sets her timer to 15 minutes past each hour instead and that helps her stay stress-free (keep an eye out for other timer suggestions coming soon). Step two: Take a look at the exercises for today. Each day we’ll send an email with three exercises for that day’s body part. The Peaceful exercise will be more of a stretching style and is perfect if you’re a little sore or not feeling very strong that day. Focused exercises are isometric, which means that you push against your own body weight or a sturdy object with no joint movement. And Energized movements are a little more challenging. Of course with any of the exercises, you should only do what feels right for you, push yourself but don’t hurt yourself. Step Three: Jump right in! We’ve done all of the planning for you. So, each time your timer sounds, all you have to do is be willing to give yourself the gift of one minute. – You deserve it. *If you are ever in the middle of something and just can’t be interrupted, simply snooze your alarm and save that exercise for the next time it sounds.Don’t dismiss that alarm though – we’ve found that you’re more likely to skip the movement altogether if you do that. That’s why we say ‘Snooze Until You Do’. One last thing. 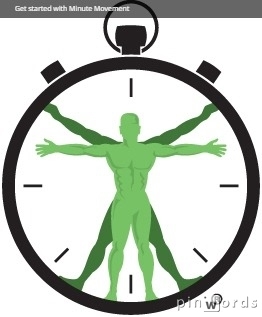 We also recommend that you do a self test when you begin the Minute Movement program (and every month or so as you continue with the program) in order to evaluate your progress. Members can find downloadable worksheets as well as assessments that are then compiled to track your progress on the Member page.